They call on into the night darkness, but there is still light from the parking lot lanterns and that giant TV in the house across the courtyard from us. You can watch cartoons through the windows, even at 1 AM. The girls play in the courtyard, too. Sometimes they climb up to the top of the slide and pretend to have captured a sailing ship, loaded with treasure, like silly sinister pirates on the high seas. Other children of the nearby houses attempt to retake the coveted vessel but these modern­ Tartu Anne Bonneys and Mary Reads know how to use their girl legs to kick them down the slides. “Arr, this is our ship. Beware!” I only know one of the girls’ names – Mia Laura – and that is because she was one of the first children ­­actually the only child in the area now that I think of it ­­ to walk up to me and start a conversation in English. “I zpeak ze Englizh vluently, ya know?” she said with hand on hip. Mia Laura has the body of a yellow string bean, the bluish pallor of the full-blooded Estonian, straw­-colored hair, slits of eyes, but there are very smart blue irises beneath those slits. We walk. “Mia Laura, how did you learn English anyway?” I ask. Her head dips to catch my English. Then comes the response with all of those lovely ‘r’ trills. “Wait, what?” I almost knocked my cup over when I heard it. When I heard the accent on the words, I knew who had yelled it. And when I peeked over the barrier that encloses our balcony, I saw that little string bean of a girl standing like a haughty and merciless pirate from the top of the slide. It was Mia Laura the Cartoon Network watcher, and she repeated it, so I tried to write it down phonetically. “Vaddafukarjutalkingabout?” No, no. Vattafakarjütäkkinkabõut? Wow. I liked it. It looked almost like a real Estonian compound word. If there could be kuulilennuteetunneliluuk* and sünnipäevanädalalõpupeopärastlõunaväsimus*, then there surely must be room for Vattafakarjütäkkinkabõut? I stared at the text on my laptop screen. There is a sparkliness, a dazzling charm to any new word, and the writers I admire best are the ones who coin new ones. And it’s not just the length of the word, or how it sounds, but also how it looks. The more I looked at my precious new Estonian word, the more it resembled the name of that volcano in Iceland, that one that caused all the travel disruption a few years back – Eyjafjallajökull. Who doesn’t remember staring at that odd name in The New York Times and Postimees and trying to pronounce it and feeling bad for all of the TV reporters who had to say it during their dispatches from the land of fire and ice? Ey­ja­fjall­a­jö­kull. Six syllables, some eye candy umlauts. Walking beneath the yellow and red trees of Tartu later, already wintry coldness in the wind, and the faintest hint of chimney smoke making it just more nunnu, I thought that it was a shame that Estonia didn’t have its own volcano. If the Icelanders could have them, and the Japanese, too, then why not Eesti? It wasn’t fair at all. But Estonia’s own volcano. Hmm. What would it look like? Surely it would be somewhere down there in Võrumaa, Haanjamaa, toward the Latvian border highlands, towering over Suur Munamägi, Big Egg Hill, elevation 318 meters, or 1,043 feet above sea level. As the dirt from my feet kicked up along the paths beside Tartu’s silent snaking Emajõgi River and I passed some old fishermen, I mulled it more. If Estonia ever did get its own volcano, there would certainly be a competition to name it, like there was with the home improvement store Ehitus ABC or the new shopping center in Viljandi – Uku Keskus. Then I could submit my cool new word to the review board for evaluation. Justin Petrone is a journalist and the author of half a dozen books, including the My Estonia trilogy. He is a columnist for Postimees and has contributed to Eesti Päevaleht, Estonian World, and other publications. He also maintains the blogs North! and Itching for Eestimaa. This piece is part of his new collection, Sketches of Estonia. 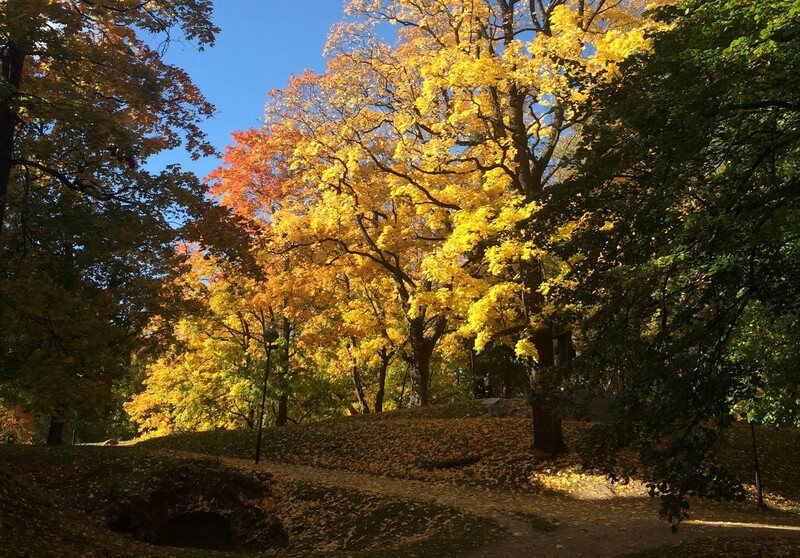 Header image – Autumn on Toomemägi, Tartu. All images credit Helen Wright. © Deep Baltic 2016. All rights reserved. Like what Deep Baltic does? Please consider making a monthly donation – help support our writers and in-depth coverage of Estonia, Latvia and Lithuania. Find out more at our Patreon page. Good writing from an undervalued talent in our midst. Keep it up.